Whether it’s high-end wall décor for a city hall, branding graphics for a charitable foundation’s offices or a business achievement timeline for a financial institution, Portage, Mich.-based Agio Imaging, a large-format custom print solution provider, has turned to Dibond® aluminum composite material for its durability and outstanding ink adhesion. While Dibond may best be known for the excellent durability it offers in outdoor applications – including both flat and structural signage – Agio Imaging began using Dibond for both exterior signage and long-term interior décor elements soon after the company began business operations in 2002. Agio Imaging is focused on meeting wide-ranging custom graphic needs of both local and national clients and regularly recommends digitally direct-printed rigid substrates – including Dibond – for their durability, sleek appearance, fast production times and improved color saturation. Agio Imaging direct prints Dibond – supplied by the Grand Rapids, Mich., branch of distributor Laird Plastics– with a super-wide-format UV printer. Agio Imaging recommends Dibond for creating interior décor pieces designed for permanent installation – although some pieces may be swapped out, depending on the hardware and installation method used, according to Logan. 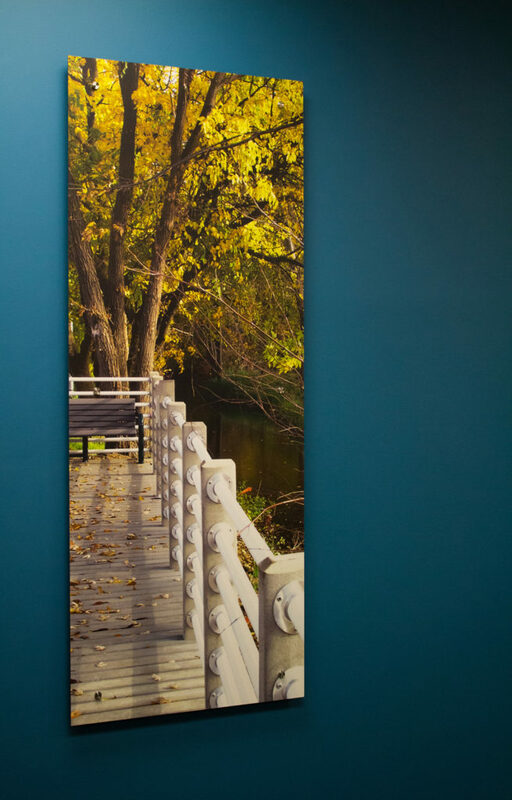 When the City of Portage, Mich., decided to renovate its city hall in 2014, officials turned to an architectural interior designer and Agio Imaging for help in reflecting the city’s beauty through a series of local photographs to be installed as large-format interior wall décor. Agio Imaging recommended that the 10 large images be direct-printed in four-color process onto 3mm Dibond – using either the Brushed Silver or White colors depending upon the desired effect. A photograph of a stream cascading over rocks in a local park was direct-printed and bled to the edge on Dibond Brushed Silver in dual panels measuring 47.5 inches by 47.5 inches. The diptych wall art was installed with stainless-steel standoffs in a city hall waiting area. Two additional images taken at a local park were direct-printed with a four-color process and full bleeds on 3mm White Dibond panels. 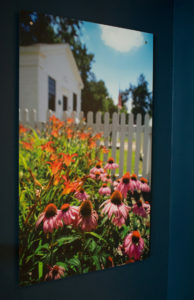 One 35.5-inch by-58-inch image features bright flowers blooming in front of a white picket fence. The other 35.5-inch by 71.5-inch image captures a peaceful tree-filled landscape and park bench. Both pieces of wall décor were installed with stainless-steel standoffs. 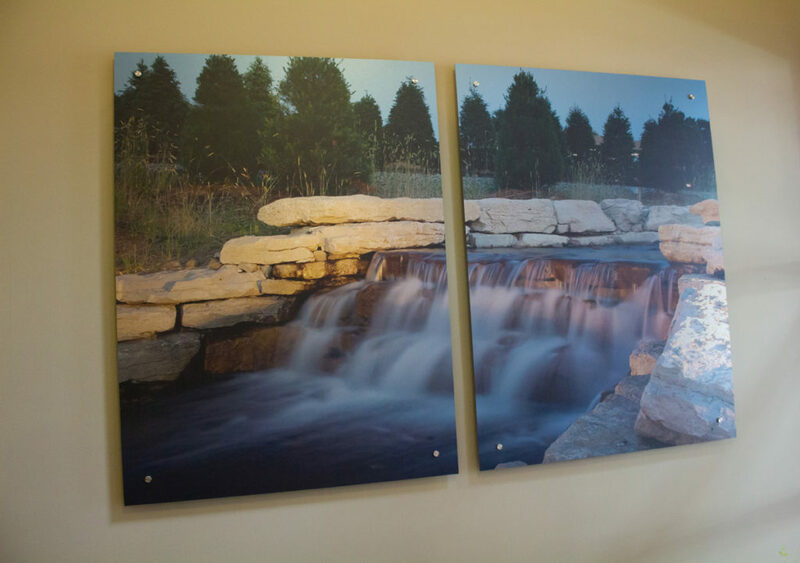 “They absolutely loved the results; the interior designer had never used a product like Dibond for artwork,” according to Logan, who said that Portage city officials were so impressed with the city hall décor that they ordered additional panels printed on Dibond for installation in another city facility. The W.K. Kellogg Foundation (WKKF), founded in 1930 as an independent, private foundation by breakfast cereal pioneer Will Keith Kellogg, is among the world’s largest private foundations and has awarded grants in the United States, Mexico, Haiti, northeastern Brazil and southern Africa – all with the goal of providing children with an equal opportunity to thrive. Among the largest philanthropic foundations in the United States, the WKKF works with communities to create conditions for vulnerable children so they can realize their full potential in school, work and life. 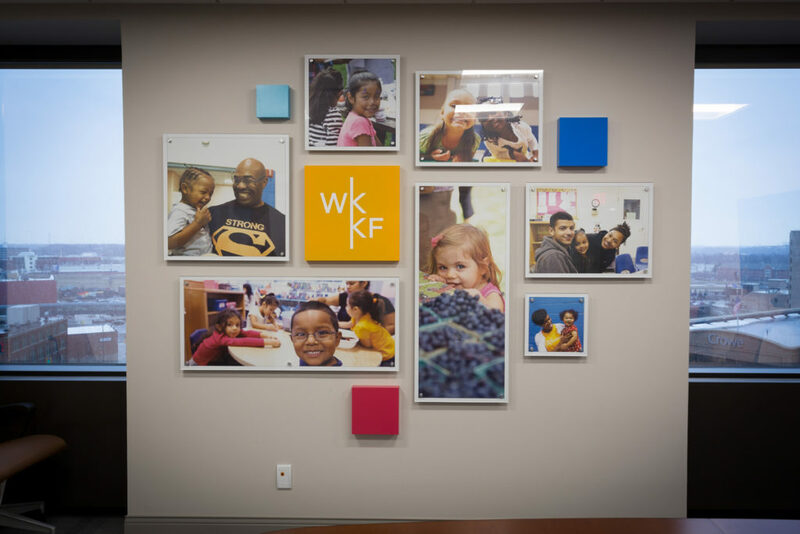 So, it’s no surprise that children would be the focus of new wall décor created in 2014 for the WKKF’s Grand Rapids, Mich., office. 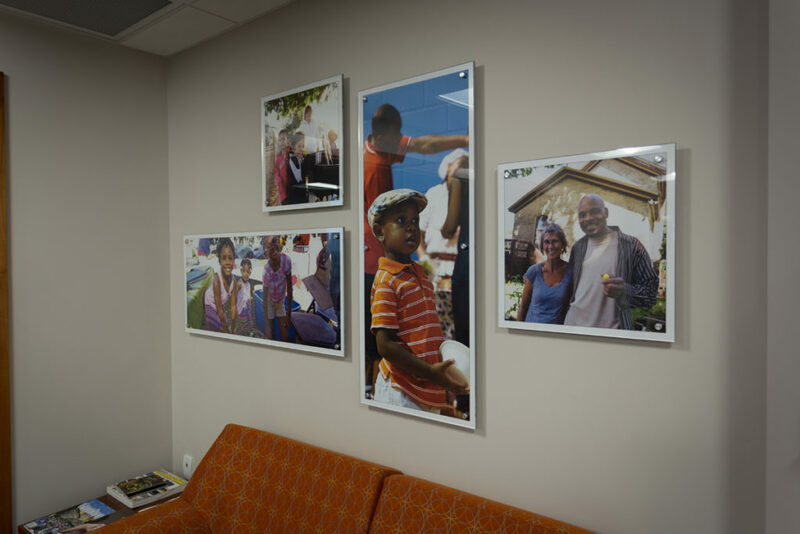 Agio Imaging direct-printed 11 child-filled images ranging in size from 12 inches by 12 inches to 42 inches by 18 inches on 3mm White Dibond, leaving approximately 1 to 1.5 inches of the Dibond edges exposed to form an even border around each image. Each piece was finished sandwich-style with a silver barrel, Dibond print and acrylic cover sheet “to add depth and a high-gloss sheen,” according to Logan. The prints were arranged in two groupings in the office waiting room and wall-mounted with milled aluminum. 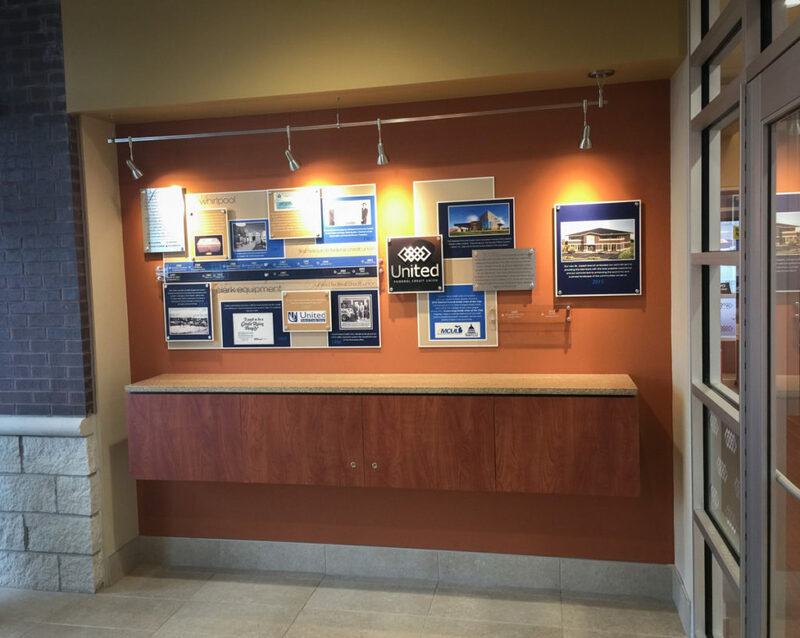 Agio Imaging recommended 3mm Dibond in both the Brushed Silver and White colors for direct-printing a multi-layered historical business timeline for the St. Joseph, Mich., branch of a federal credit union. Designed to freshen the lobby area and fill a 105-foot-wide by 34.5-inch tall wall space, the timeline was comprised of a total of 12 printed panels. Ranging in size from 8-inches by 6-inches up to 47-inches by 33-inches, the panels featured historical photos, logos and business mile markers. “They wanted to depict their business journey from its beginnings to the present,” said Logan, of the dimensional timeline, which was designed by one of the sub-contracted graphic designers in Agio Imaging’s network. In addition to printed images and text, the Dibond was printed in shades of blue, tan and black as background colors, according to Logan, who said Agio Imaging matched PMS colors selected by the designer. The printed Dibond timeline elements were installed with stainless-steel standoffs to create a sense of depth.